If you are going to launch your blog or website, your first step should be finding a top class domain name which represents your niche or site topic. • To know what your website is about. • Help them decide whether they should visit your website to find relevant information. • Can increase click through rate on SERPs. Following are some of the tips for finding best domain name for your website. Always go for top level domains like .Com, .Net, .Org domain names. Although there are new domain extensions available today but I recommend using .Com domain name as it is oldest, credible & most trust worthy domain name extension available today. Another reason about going for .Com domain is because it is observed that google normally gives better place to sites with .Com domain extension on its search engine results pages. Along with .Com, you can also register .Net or .Org if you are a company (according to the nature of your organization). It is always a great idea to keep your domain name short so that it is easier for the users to remember. Otherwise, there may be a chance for users to enter typos with longer domain names or forgetting your domain altogether, ending-up resulting in loss of your website traffic. Keywords play a key role in obtaining a better search engine ranking and improve your visibility on different search engines. You can also choose to select a domain that contains your main targeted keyword as it tells the search engine what your website is about. So, it is always beneficial if your website domain contains your main targeted keyword. Finding a keyword rich domain name or exact match domain is very hard. You need to be creative and do a thorough keyword research to find the best combination. Try to find a domain name that is unique and brandable. This will help your website standout among your readers and be remembered in their minds as a brand. Brandable domains are appealing, notable and catchy. For example, Godaddy is a brand, but bestdomainnametips.com is not. So, be creative and brandable when choosing your domain name and don’t be generic one. Your domain is your website’s identity, a good & easy to remember domain name can put lasting and positive impression in user’s mind and help them remembering what your site is about. This can help your site getting constant flow of new as well as returning visitors. Finding the right domain name for your website can be a challenge. You need to be in the right frame of mind and use the right set of tools for finding the perfect matching domain for your website. 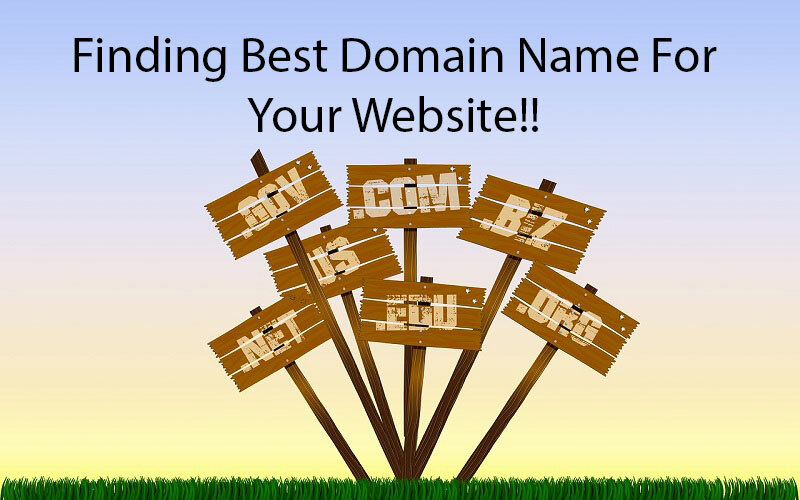 Below are some places for finding best domain name for your website. Searching through Expired Domains database is a great way to find a perfect domain match for your website. Thousands of domains expire everyday. Many of these domains are expired because of so many reasons like some people register domains in bulk and they forget to renew some of them, many don’t need some particular domains anymore. There are many sites like ExpiredDomains.Net, DomainHole and many others where you can search recently expired domains and who knows you may find a great domain for your new website project. Domain Auctions is another popular way to find quality domain name for your next website project. A domain auction marketplace facilitates people to buy existing registered domains from their respective owners who wish to sell them. At Domain Auction Marketplace, you can easily find premium quality top level domain names but at higher prices. SnapNames, GoDaddy Domain Auctions, Flippa & SEDO are some well-known domain auction sites where you can find premium level domain names for your website. Another way to find a quality domain name is by doing keyword research. As we have mentioned above about finding keyword rich domain, the idea is to find the relevant keyword for your industry and combine is with your company brand, business name or even with your own name to make a perfect domain name for your website. For example, if you are bob and your blog is about marketing, you can register a domain name like “BobsMarketingTips.Com” or something similar. OR you can combine the keyword “Marketing” with your company. (This is just an example to give you an idea). There are so many ways you can use to find the domain of your choice. For keyword research you can use Google Keyword Planner, UberSuggest, Keywords.Io and many other keyword research tools. Once you decide the domain name for your website or blog, next step is to register your domain with a domain registrar. Following are some popular domain name registration companies where you can get your domain registered at low cost. As you know already that you need a webhosting space to host your website. Many webhosting companies offer free domain registration with new hosting accounts. It is a smart idea to take advantage of this offer, as it can also help you managing your domain as well as hosting from one central place and helps you save money too. Following are some of well know webhosting providers with free domain registration. One of the oldest and most reliable webhosting services provider, offering free domain registrations. Once you register with them and order a hosting plan, you will get free domain registration…Checkout Free Domain offer at BlueHost. They offer Free Domain, Free Site Builder & with top notch technical support. Selecting the domain name that is right for you is crucial for your success. It is so important that you choose the right domain from the start as it can be a hassle later on if you look to change it as it can not only hurt your brand but it can also do negative impact on your search engine rankings which results in losing valuable traffic to your website. Choosing the right domain name will have significant impact on your website potential & success. So, make sure you put a lot of thought process when choosing a domain name for your website. Join our mailing list to receive latest blog posts, news and updates.